Queens of the Stone Age have revealed that they're back in the studio recording the follow-up to Era Vulgaris. 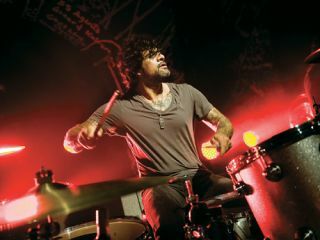 Drummer Joey Castillo first revealed in his September 2011 Rhythm cover interview that the band were hard at work penning their first album since 2007. Back then he told us that he expected the recording of the new album to differ from the drawn-out process used during the Vulgaris sessions: "We've been banging some stuff around here and there. Very loose and just throwing ideas out. The plan so far is not to write the record completely in the studio. That process during Era Vulgaris was something none of us had really done. It was something that we signed on to do and actually I don't think it will ever happen again like that. It's a very tedious process. "It's not so much that there isn't any material, you almost shoot yourself in the foot with figuring out when it's supposed to end. When there is no kind of allotted time set aside to do something you just go and start second guessing and triple guessing. Then you get this person's opinion and that person's and you go back and listen and want to re-play and it's a real strange and long process." He went on to tell us that the band's 2011 tour in support of the re-release of their debut album had influenced his thinking for the new record. "…For myself there's a big part of me that would like to do something in the vein of the first record again. A very stripped down, part-orientated, drummy kind of thing. I really enjoy that. I wouldn't be surprised if something like that appears."